If you are fishing in salt for the first time, or an experienced journeyman looking to improve, the Bahamas may be a good place to start. The large number of bonefish that inhabit the waters make any of the Bahamas a fine destination no matter what level you are at. Fisherman can cut their teeth on schools of bones that are free swimming or mudding. In General these fish are usually small to medium-sized, ranging from one to four pounds. But some larger fish have been seen and caught in the schools of smaller fish. There are places which hold much larger fish but are typically more remote and less traveled. The numbers of smaller fish are great and they are not shy about taking a fly but the bigger ones need to eat too. The more experienced angler can await the larger fish that are usually solitary hunters or pairs in the many creeks and streams. There are many guides who had described Bonefish in the 12-15 pound range (5-7kg) and it is not unlikely to see these monster bonefish on the west side of Andros and southeastern, less fished islands. The most common destinations for Bonefish in the Bahamas are as the Abaco Islands, Exumas, Andros, Berry Islands, Bimini, Cat Island, Eleuthera, Long Island, Crooked Island and the Acklin Islands. Provided below are highlights, but remember that VIP members can have just about any question answered in 24-48 hours. Great Abaco is the third largest island of the Bahamas and is probably best know for its fabled Marls of Abaco south on the west side. Located at 26 degree North Latitude, Abaco is less than an hour’s flight from the major Bahama airports. The super shallow water & soft boggy eel grass covered ground does not allow for wading so this amazing Bonefish mecca must be fished from a skiff. While best known for the Marls, the the northeast side off of Treasure Cay /Man Jack Cay offers incredible bone fishing.. Sandy Point is also located on the south west side & is also a leap off point for More’s Island and Gorda Cay which also contain large numbers of & just plain large Bonefish. Green Turtle Cay is one of many cays that lie to the east of the Great Abaco Island, so if you are planning a trip to a remote place looking to catch large Bonefish, Permit, & maybe even a Tarpon, Green Turtle Cay could be the place. Bonefish can be found throughout in decent numbers, during all tidal stages. The tide comes in, and with it come the bonefish. You can see mudding schools tailing everywhere. Don’t be surprised if your target becomes Permit and not Bonefish as they are also plentiful. There are rock cliffs an scenic views on Abaco which also make this a great couples destination for the non-fishing spouse or partner. Acklins Island is at the southeastern end of the Bahamian island chain. At 23 degrees north latitude, it sits just below the Tropic of Cancer. The majority of the rain is usually late spring and summer and most lodges close between July and Sept for rainy hurricane season. Acklins boast some of the most pristine and minimally pressured flats in the Bahamas. If you prefer wading, this is most definitely the place for you. Also because of the very skinny water where you’ll be fishing make sure you bring some smaller (sizes 6-8) unweighted flies (more details in the gear section). Permit are found feeding along the edges of the flats in the deeper water when they can use the channels to enter & exit the flats in their usually paranoid fashion. Since 2003 the numbers of Permit caught here convince us that Acklins is a legitimate Permit fishery as well. Tarpon pass between Acklins and Crooked Island, but not in numbers or specific locations that allow us to call it a tarpon destination but you might get some shots at them. Located in the northern end of Acklins, Grey’s Point sits on Relief bay, which itself contains numerous productive bone fishing flats. Permit are also seen on these flats, as well as barracuda, jacks and sharks. You have access to many other fishable flats, such as Abrahma’s Bay on the West Side, Mason’s Bay on the east side, Snug Corner & Lovely Bay to the North all from 10 to 45 minutes away, and all located on the northern end of the island. It would take weeks to explore all of the flats just at the northern end of Acklins. Andros Island, is undoubtedly the most well known of the Bahamian islands, located approximately 137 miles east of the Islamorada and the upper florida keys. This Island, is over 100 miles long and 40 miles wide, with a total population is only about 8,500 people. Located at 25 degree north Latitude, most of Andros is completely uninhabited. Thats good for fishing as it consists mostly of a vast area of flats, creeks, cayes, cuts, mangroves which prove to be consistently fertile fishing grounds. You’ll hear that the biggest Bonefish in the world are in Biscayne Bay or Christmas Island or Hawaii, but no one can say for sure definitively. There are big bones in Andros if this is what you seek. Andros could be the best island in the Bahamas – if not the best in the world – for bonefish, both big and small. Just adjacent to Andros lies a huge Barrier reef, the third largest in the world which provides abundant sea life and fertile waters. North Andros is less known than South The white sand flats of North Andros could be some of the most beautiful and most fishable flats in the world. Joulters Cays, Lowes Sound Joulters, Red Bay, Westside through the Bights, Stafford Creek, Fresh Creek, and Ocean Flats are very popular place to fish. North Andros is an amazing fishery and also quite good for Permit and Tarpon as well. Is is not unlikely to see schools of hundreds of bonefish spiraling the flats in search of food. This is a waders paradise. South Andros stakes claim to Deep Creek, Little Creek and Big Creek the southwest Cays which all can boast 12-15lb bonefish (5-7kg). One of the main draws for anglers visiting South Andros is the uninhabited West Side of the island and the southwest cays. A large portion of unexplored territory still exists on the West Side, and the lack of consistent fishing means fish are rarely pressured. This equates to a large population of fish, many of which reach world-class size. As mentioned bonefish on the West Side can push 15 pounds (7kg). The west side of the island and the southwest cays are universally acknowledged as one of the premier trophy bonefish areas in the world. The west coast is also one of the better destinations in the Bahamas for Tarpon, however fishing for tarpon is usually best during the warmer months which is not as good for bonefish. To get to the southwest cays from most South Andros lodges is about 2 hours by boat, but is most definitely worth it. If you seek diversity, it’s there. There are opportunities for Tarpon, permit, jacks, barracuda, sharks, Snapper, Grouper, Mahi-Mahi, wahoo, and many other species, including Marlin. Bonefish, Permit, Tarpon, Barracuda, and Lemon Shark can also be found on the flats throughout the year but certain times are better than others. Chub Cay and the sand flats of the Berry islands deserves a mention here. This is an incredible Bonefish fishery and is not very well known. The population of these undeveloped islands is only about 700 inhabitants, so when we say the flats are pristine and un-pressured, we mean it. The fishing is very similar to Bimini & North Andros as it is located at 25.7 latitude just 27 miles north of Andros and 70 miles due east of Bimini. There is also great offshore fishing here which is really less than a mile from shore. One can expect large Bonefish, Permit and even some decent tarpon fishing depending on the time of year as they migrate through. At 27.5 degrees North Latitude, Bimini is just around 47 miles off the coast of Miami, Florida. Bimini is a fishing Mecca that is so close to the USA that it’s reachable by boat in under 2 hours in calm conditions. Bimini is actually two bigger islands North & South with some smaller cays (Pigeon Cay & Alec Cay)and boasts over 20 world records including many bonefish, permit and billfish. This is a fisherman’s paradise from every perspective. For such a short ride & small collection of islands, there is so much bonefish history. Bimini holds four World Record bonefish catches, all more than 12 pounds. There are vast stretches of unspoiled flats and an abundance of big fish in the waters around Bimini and that includes Permit. Angling pressure on the flats is typically & consistently low to insure a quality experience. Some hot spots include the tip of North Bimini known as Moselle Shoal, or just off Bimini Bay’s Three Sisters Rock. Another great spot is Great Isaac Rock, located fifteen miles north for Atlantic Marlin, Sailfish Dorado and other species. If Bonefish is what you want, you can head over to the Great Bahama Bank and wade barefoot in the crystal clear waters where big bonefish are known to haunt. You’ll also see tailing Permit sliding on and off the flats near the channels. Anglers will find great fishing around Bimini year-round, but certain seasons are prime for specific game fish. Winter is when you’ve got the best shot at mackerel and wahoo, those blue water beauties that have the teeth of a barracuda and the speed of a surface-to-air missile but are tough on a fly. You’ll want to have the 14 weight rigged and ready for offshore (about 500 yards) in spring and summer for blue and white marlin, sailfish, dolphin (mahi mahi) and blue-fin tuna. Though the fishing for them is good all year, the summer months, when the water is calmest, is the best time to set up over the wrecks and reefs for grouper, snapper and barracuda. On the flats, summer is also when the permit are on the hunt around Bimini. Bonefish, is excellent all year long but best in the April – Sept.
Cat Island Located at North Latitude 24.29 and is about 125 miles due east of Andros. Seems that Cat Island has developed a reputation for being a DIY fly fishing destination which is true to some degree. While there are ample guides and lodges available, many fish the flats easily reached by foot or car. The best flats fishing is at the northern and southern tips of the 48 mile long, 4 mile wide island There are a few options through the middle sections, and some ocean flats on the north shore. So the accessible DIY areas are rather spread out and frankly heavily fished. At Smith Bay located on the North west side there are vast bonefish flats, but are regularly pressured so the fish are spooky. Smith Bay is also a regional storm shelter which houses government boats during hurricanes. The best right-out-your-door fishing is from Greenwood, Pigeon Cay, Bennett’s Harbor, and Hawks Nest but again plan to see tailing fish that spook. There is good fishing in general around the island but this is weather dependent in winter and early spring which seem to be the best months. The creek flats behind Hawks Nest Marina fish well, but take your insect repellent because it can get very buggy. When the wind is down, the best fishing seems to be the ocean side flats south of Greenwood Beach Resort or the larger flats in front of Pigeon Cay and Bennett’s Harbor. Pigeon creek is touted and an excellent bonefish destination. Offshore Anglers have traditionally had great success for tuna and dorado from Hawk’s Nest. Orange Creek on the Northwest side is a large, shallow creek that cannot be effectively fished by boat. But, the advantage is, almost the entire creek can be fished on foot even at high tide so if wading is your interest, this is a very option for you. Located at 25 degree North latitude Eleuthera is the northeastern most island the Bahamas. A popular destination for both fishing and for its plush pink and white sand beaches and breath taking views. In addition to Eleuthera’s amazing beaches, hiking, world class surfing, excellent diving, there is also great fishing. That is why Eleuthera is considered by many to be one of the most enjoyable Bahamas destinations for families & couples and probably our top pick for couples destination travel. Eleuthera, from the Greek word meaning freedom, became the birthplace of the Bahamas and the first settled settled of the Bahamian Islands. What makes it so great for DIY fly fishing is the size & shape of the island. Eleuthera is very long and narrow, only 110 miles long but less than a mile wide. You can go coast to coast in minutes. To the east, is the Atlantic Ocean and to the west, the Caribbean Sea. The water depth drops off considerably on each side of the island so accordingly, all of the shallow flats suitable for bone fishing are close to the mainland making them easily reached by wading. the coastlines have sufficient roads, you can drive to most of the good bone fishing locations very easily. A boat is not needed to get to the flats, just a rental car and wading gear. The shape of the island with the Atlantic/Caribbean coasts less than a mile apart creates another phenomenon on Eleuthera. Each side of the island has a separate tide about two hours apart. What that means is fly fisherman can fish two rising tides, two hours apart. Fish the rising tide in the Atlantic and then drive a couple minutes to the Caribbean side and fish the rising tide there. Eleuthera has double the amount of incoming tide fishing time. A caution about DIY fishing. Eleuthera has become one of the most popular islands for DIY fishing, and therefore, many of the obvious flats are heavily pressured. The bonefish of Eleuthera have become educated, wary and frankly very spooky. Find more remote areas to fish! The further you get away from these well-known areas, the better chances you’ll have of finding fish that will eat a fly. Places like Savannah Sound and Pelican Cay, are now flooded with anglers and the fish are very aware. DIY in the Bahamas is really becoming just that. If you don’t have sufficient travel do trial & error spots just hire a guide, it’s usually worth it. There are many other fishing opportunities as well, the flats like other Bahamian islands are home barracuda, jacks, snapper, permit, and tarpon. It is possible to get the Grand slam in Eleuthera, but very, very unlikely. Seeing all three in a day of fishing would be exceedingly rare and we don’t even think about a slam here. The deep waters around Eleuthera which are not far off the coast are home blue marlin, mahi-mahi, wahoo, white marlin, sailfish, and some big sharks. There are some many places to fish in Eleuthera, but listing them here would not do them justice nor would it be an appropriate use of space. As far as couple destinations, this is the best. You can fish, dive, snorkel, explore caves, or stop and marvel at some of the island’s sights, like Ocean Hole, Preacher’s Cave, and the Glass Window Bridge, one of the few places where you can compare the rich blue waters of the Atlantic on one side of the road with the calm turquoise waters of the Caribbean on the other side. Is a cluster of over 360 islands or cays located south/southeast of Andros @ 23.4 degrees north latitude is an exceptional bonefish destination . Great Exuma, the largest island in this cluster is approximately 2 miles wide by 36 miles long. The Queens Highway runs tip to tip and serves as the main artery of the island. George Town is the major hub and sits at the center of the island protected by Stocking Island and forms one of the most striking harbors in the Bahamas. Many celebrities has purchased islands in the Exumas and make their second home there. The southern bonefish flats are protected from typical winter fronts but is certainly not the only place to find the bonefish around Great Exuma. It boasts renown flats like Airport, Rolletown, White Bay, Channel Cut. There are just some of the hot spots to fish for bone in the Exumas. Remember, there are over 325 islands and vast mangrove lined creeks, channels and flats to fish. A rarity you might encounter which you might not see in any other place other than here is a blue nosed Bonefish. As you may or may not know, there is a characteristic black spot on the tip of Bonefish’s noses which is usually black and sits just just above the dorsal pink lip. In Exuma there have been fish caught that have a blue nose rather than a black nose. There has been no confirmation from researchers as to whether this is a particular species or just a genetic anomy. Why we’ve included the Exumas, BIG bonefish live there. This is a place like Biscayne Bay and Bimini where big bones are a common find, not an exception. The average bonefish in Andros is 2-4 pounds while in Exuma, the range jumps to 5-7 pounds. In essence, even the average bonefish are quite big and produce blazing runs. Most of the water at high tide cannot big fished by wading so hiring a guide is usually the best ideal. The is plenty of opportunities to wade as the flats are mostly hard sand, with very few eel grass boggy surfaces. Permit are plentiful here, but unfortunately, there are not many tarpon. If the Grand slam is what you seek, this is not the place for you. If you seek a blue nosed Bonefish or a large bonefish in the 5-10 pound range daily, jump on in….the water is nice. Offshore is also an amazing fishery which houses Blue Marlin, Tuna, Dolphin (Mahi Mahi) Barracuda, Shark and Wahoo. there is plentiful water and lots of it. Exuma is a 1.5 hours flight from Miami and is not a heavily traveled island by fly fishers. While its a great fly fishing destination, many opt for the consistency of Andros or the convenience of Bimini. Flyboss would love to buy an island in the exumas for a private lodge……someday. Long Island is about 84 miles (136 kilometers) long and 3.72 miles (6 km) wide at its widest point. Long Island is situated about 160 miles (265 km) southeast of Nassau. The Tropic of Cancer (relating to suns apex per given year) runs through the upper quarter of the island. The northeastern side is known for its steep rocky hills and cliffs, while the southwestern coast contains soft white sand beaches which reach as far as the eye can see. Long Island is particularly noted for its caves which have been a tourist attraction and divers haven. 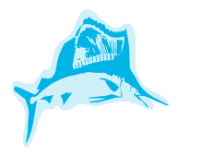 Dean’s Blue Hole is located west of Clarence Town. It is the world’s deepest underwater sinkhole with a total depth of about 565 feet (200 meters). That’s more than double the depth of most other large holes. The waters off Long Island have some of the Bahamas’ finest saltwater fishing. First-time saltwater fisherman will find Long Island to be a productive and rewarding Bone-fishing experience. The more seasoned angler looking to focus on large bonefish, can definitely find some larger fish around Cape Santa Maria and Columbus Harbor. Long Island is surrounded by small bays and numerous inlets, including New Found Harbor west of Deadman’s Cay, around the middle part of the island. There are also smaller islands off-shore, including Sandy Cay to the southeast. The flats are accessed and fished utilizing standard shallow-water skiffs but these two northern lagoons both offer great wade fishing in shallow, skinny gin clear Bahamas water. Anglers can schools of bonefish from 40 to over 400 in a single school. The size of the bonefish can range anywhere from 2 to over 10 pounds. Bonefish are found on the flats year-round due to the southerly location of Long Island and the warm consistent waters just north of the equator. Permit are there, but never in great numbers, they are found during certain times of the year. Use the flyfishbonehead calendars to check which months are best. Deep sea adventure, fishing with blue water guides can give you better than average shots at Marlin, Tuna, Shark (Mostly Nurse & Lemon), Dorado, Sailfish and other species.Long Island is probably one the best islands from the non-angler perspective. There are so many thing for non-anglers and family to do while the anglers enjoy the white sand flats and plenty of bonefish as well as the off shore species. Turneffe Crab, Bauer Crab, EP Permit Crab, Bonefish Bitters, Merkin Crab and epoxy flies. We are always on the lookout for tropical destinations that have it all: the private, white sand beach, walk and wade fly fishing right outside the door, skilled guides, elegant accommodations, and numerous high quality activities for non-anglers. Located in one of the most beautiful and pristine areas in the Caribbean, Tiamo Resort on South Andros is a unique and refreshing gem. Technically an eco-tourism resort that can accommodate 22 guests. 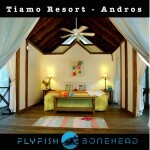 Tiamo also offers an exceptional bonefishing venue limited to ten lucky anglers per day. In addition to high numbers of hearty bonefish, anglers will also encounter tarpon, barracuda, and jacks on the turquoise flats of the region. While Tiamo boasts an excellent saltwater fly fishing program, it prides itself on being one of the Caribbean’s top nature resorts where non-anglers enjoy snorkeling, scuba diving, sea kayaking, sailing, freshwater pool and guided nature hikes. Add to that a main lodge with fine cuisine, a quality wine list, full bar, library, and very tasteful, air conditioned rooms and you will quickly see the appeal of this unique destination. Tiamo’s private beach-front bungalows with private baths epitomize rustic luxury and are located mere steps from the water. For couples, serious anglers, and families with children twelve or older, this is the ultimate tropical paradise. Located in one of the most beautiful and pristine areas in the Caribbean, Tiamo Resort on South Andros is a unique and refreshing gem. Technically an eco-tourism resort that can accommodate 22 guests, Tiamo also offers an exceptional bonefishing venue limited to ten lucky anglers per day. In addition to high numbers of hearty bonefish, anglers will also encounter tarpon, barracuda, and jacks on the turquoise flats of the region. While Tiamo boasts an excellent saltwater fly fishing program, it prides itself on being one of the Caribbean’s top nature resorts where non-anglers enjoy snorkeling, scuba diving, sea kayaking, sailing, freshwater pool and guided nature hikes. Add to that a main lodge with fine cuisine, a quality wine list, full bar, library, and very tasteful, air conditioned rooms and you will quickly see the appeal of this unique destination. Tiamo’s private beach-front bungalows with private baths epitomize rustic luxury and are located mere steps from the water. For couples, serious anglers, and families with children twelve or older, this is the ultimate tropical paradise.